Free Admission for this Opening! The Chapel of Jimmy Ray Gallery which is located in the less crowded countryside outside of San Miguel de Allende, presents another intriguing Art Event on Saturday, February 23 at 1 pm. 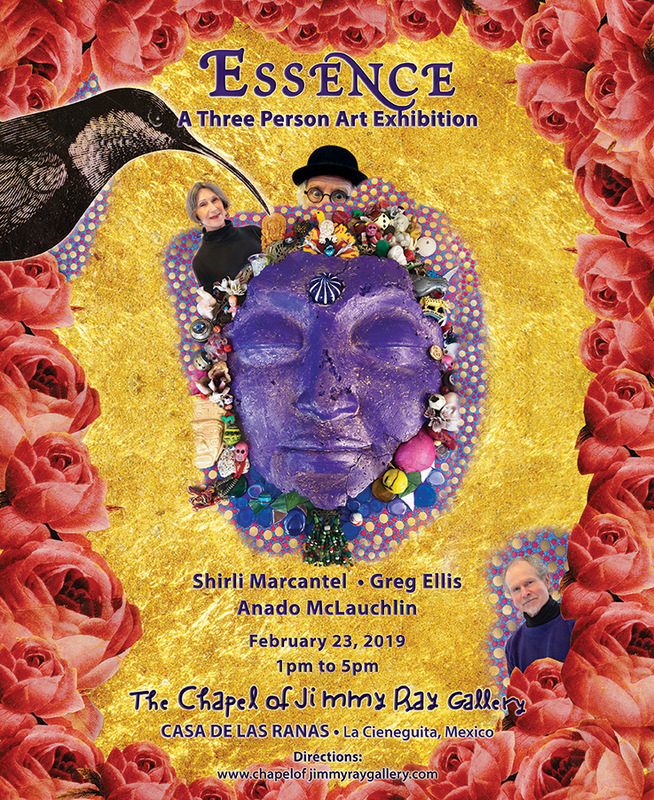 The show will run through May of this year…“Essence: A Three Person Art Exhibition” features the art of Shirli Marcantel, Greg Ellis and Anado McLauchlin and this is going to be special. The underlying essence of this event is the immersion into pattern that envelopes the eye in intrigue and fanciful rhythm. The Marcantel/Ellis collaborative is sometimes known as the Wabi-Sabi Collective. The Wabi-Sabi aesthetic is often described as one of beauty that is “imperfect, impermanent, and incomplete” The work masterfully illuminates the beauty of natural forms. Botanical motifs in pattern and decoration are the recurring themes along with the glistening light produced by metallic gold leaf. Their collaboration has produced complex, evocative ceramic sculpture and unusual mixed media , and collage works. Anado McLauchlin is the “in house” curator and artist at the Chapel of Jimmy Ray. His work glistens and glows and explores the underlying thread of irreverent placements and juxtapositions that map out the mysterious chaotic marriage of the sacred and the profane. From Centro Historico in San Miguel take Calle San Francisco which later becomes Calzada de La Estacion. Follow this street straight through the glorieta (traffic circle) and proceed to the train station. Follow the road as it winds to the left and crosses the railroad tracks. Take the asphalt road which winds to the right….follow this road through three curves and you will be on a straightaway to La Cieneguita. When you arrive in Cieneguita you will pass over three topes (speed bumps). You will pass a large green sign pointing to Guanajuato to the left. DO NOT GO LEFT-Continue straight ahead 150 meters past that sign and you will see a small lane on the right. There is a small purple and yellow sign which reads Casa de Las Ranas and Chapel of Jimmy Ray marking the spot and pointing to the right. Take that turn and soon you will come to a small Church…take a half- right turn and follow the road up the hill parallel to the Church. The Gallery grounds begin behind the Church property…you will enter at the first gate on the left. If coming for a tour you will arrive in front of the large colorful home on the left side of the road…. Desde el Centro Histórico de San Miguel de Allende, toma la Calle San Francisco que después se convierte en Calzada de la Estación. Sigue sobre esta calle todo derecho hasta llegar a la glorieta y continúa en dirección a la estación de ferrocarril. Continúa sobre la carretera conforme agarra hacia la izquierda, pasando las vías. Toma entonces el camino de asfalto que va hacia la derecha. Sigue sobre este camino pasando las tres curvas y te encontrarás en el camino directo a La Cieneguita. Cuando llegues a Cieneguita pasarás tres topes. Luego pasarás por donde está un letrero grande, verde, que señala a Guanajuato hacia la izquierda. NO VAYAS A LA IZQUIERDA – continúa derecho 150 metros pasando ese letrero y verás un caminito a la derecha. Hay un letrero pequeño, de color morado y amarillo, que dice Casa de Las Ranas / Chapel of Jimmy Ray…Da media vuelta hacia la derecha y sigue el camino hacia arriba, paralelo a la iglesia. El terreno de la Galería comienza detrás del terreno de la iglesia. Entrarás en la primera reja a la izquierda. Si vienes para un tour, llegarás frente a la casa grande y muy colorida en el lado izquierdo del camino. The Chapel of Jimmy Ray Gallery was founded in 2012 as a vehicle to present the work of Anado McLauchlin along with select artists that Anado has bonded with on a visual and oftentimes emotional level. The Gallery is located 5 kilometers from San Miguel de Allende at the Casa de Las Ranas compound in the small town of La Ceieneguita. This is an artist friendly gallery dedicated to the “road less travelled”.